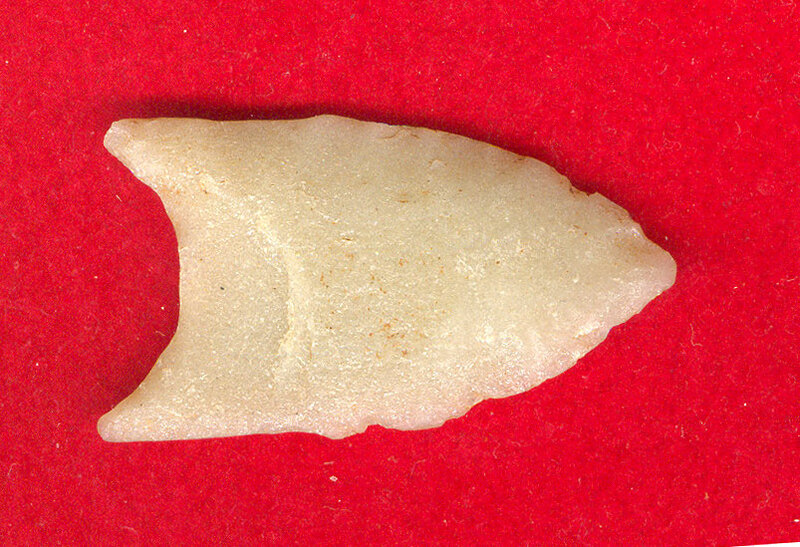 A Small Size, Thin, Rare, Visibly Aged And Repeatedly Ancienty Use Sharpened, Nicely Fluted, Clovis Point That Exhibits Surface Frosting Aging And Stone Coloration Patination, Correct Rolled Basal Stem Edge Hafting Dulling, Aged Surface Deposits And Staining, Correct Blade Sharpening Use Reduction, Correct Early Style Blade Flaking, Visible Ancient Use Wear, Correct Material And Manufacture For The Area Found. Found By Arthur Claybaugh Prior To 1950, On The Buffalo River. Ex-Arthur Claybaugh, Everette Howard And Gerald Thomason Collections. This Example Is Made Of Nice Material. Includes A Ken Partain Certificate of Authenticity.